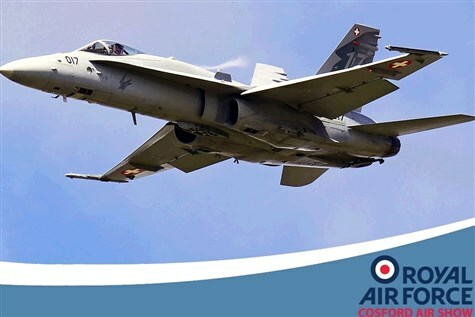 The Raf Cosford Air Show includes an action packed six hour flying display with the very best displays including powerful demonstrations of modern military aircraft, captivating appearances from iconic vintage aircraft and adrenaline pumping aerobatic displays. There will also be a huge assortment on static display for you to view up close. On the ground the Vintage Village is one of the most popular displays, focussing on WWII with the sights, sounds and smells of the era. Historical figures mingle amongst the vintage aircraft and vehicles, both military and civilian, with live music provided throughout the day, vintage tea room and vintage fair. The RAF Zone will showcase the very best of todays Royal Air Force, including a mock up Chinook Helicopter. There will be RAF Display Teams around the RAF Village and you will get chance to meet the pilots. The hangar displays allow you to see behind the scenes at RAF Cosford and all of the RAF Museums world class facilities are open with their unrivalled collection of historic aircraft. There is also over a kilometre of trade stands to browse. A great day out for the whole family!